Matthew Bureau joined Bates Mill Dermatology in January of 2013, returning to his home state of Maine. Matt graduated from Duquesne University in Pittsburgh, Pennsylvania in 2001 with a Masters in Physician Assistant studies. 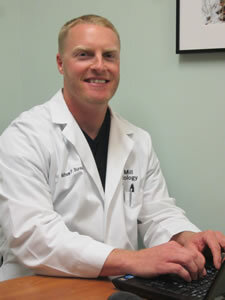 Matt began his career as a physician assistant in emergency medicine in Wilmington, North Carolina. He practiced there until relocating to Scarborough with his wife and child. Matt is a member of the American Academy of Physician Assistants and the Society of Dermatology Physician Assistants.